As part of the national event bat week, and as a culminating project for the bat unit students have been learning about in their field studies class, students at Black Butte School built five bat houses. Bat houses help bats find shelter in areas where their habitat has been compromised due to human development, pollution, or other factors, such as climatic changes. Bats are so important to the ecosystem in and around Camp Sherman because they help to balance insect populations by reducing their numbers by the millions. In fact, one bat may consume 600 insects in an hour! The students hope their hard work pays off in giving some bats a comfortable shelter in the upcoming year. 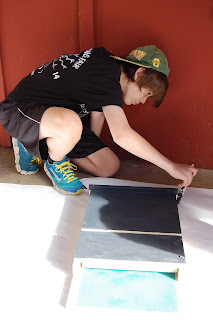 The process of making the bat houses seemed easy at first, but students and teachers really had to work together to get the nails in right and line up all the pieces correctly. Of course many students were not too pleased with the loud banging of the hammer...and others reveled in it! The finishing touch was painting the boxes black to trap heat from the sun, keeping future bat residents toasty warm on cold days. Check out this link for more information about bats and their significance. Black Butte School has Annie Painter come to instruct us students on how to paint like an artist.We students were so excited to paint and learn how it is done. When we went to make art we were in three stations to learn how to paint different kinds of colors. We made colors like crazy! The colors we made were red, blue, green, violet, orange, red-orange, yellow-orange, green-yellow, green-yellow, red-violet, and blue-violet. We made lots of papers and helped each other out in learning the process of art. Our final products for this project were “art books” that include uniquely shaped cut-outs of our colored and textured papers, and blank pages for us to use for future drawings or paintings. I am excited to use mine to practice drawing in. On Friday, October 2nd we went to Suttle Lake Camp for the school day. Adaptation was our theme for the day. In the morning, we played cooperative games to help with our teamwork skills and learn how we as individuals can adapt to new situations. In my favorite cooperative game, we had to work together to all cross a “hot chocolate river” with “marshmallows.” What it meant was we had to cross the ground between two lines (about 30 feet apart) by only stepping on mats (the marshmallows) set at different spaces apart. It was hard because someone always had to be touching a marshmallow and couldn’t fall into the hot chocolate. It took a lot of teamwork and took a while for us to figure out how to do it successfully. But we did it and felt great afterwards. It was a fun day. Since I live at Suttle Lake I didn’t have to ride the bus. This made it even better. 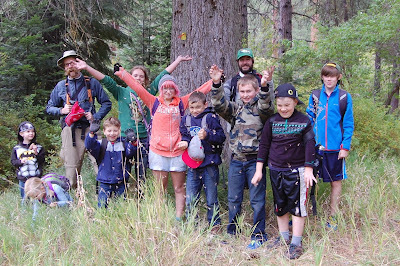 The Black Butte School camping trip was pretty fun! Thursday morning before we left, we looked at a map to try and figure out how long it might take us to get to our campsite. We thought maybe it would take an hour. Then we got our packs on and off we went! Even though we could have gotten to the campsite in an hour, it took us about 4-5 hours. We played lots of games and took lots of breaks. My favorite game was right after lunch. We were right next to a huge log. The whole idea of the game was to line up on the log--without anyone falling off --according to our birthdays, not years, but months! It didn’t matter if you were 12 or 5, we just had to line up from January birthdays to December birthdays. There were 6 summer birthdays and 5 Fall, Winter, and Spring birthdays. It was really fun! After that game we did a stick race, a.k.a. Pooh sticks, at a little bridge. I got second place the second time, which I felt pretty good about. We went the rest of the way to the campsite playing games and throwing berries at each other. Ultimately we ended up at our campsite where we were met by our families, ate great food (including s’mores! ), told funny stories, and saw bats. The next day we hiked and played more games all the way back to school. It was a fun trip! Sawyer's face pretty much sums up how much fun we all had camping!